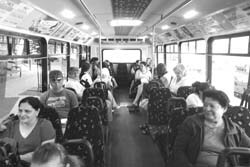 A survey completed this month shows that bus riders and non-riders alike are generally favorable to the services provided by Mountain Rides Transportation Authority. A result summary is filled with positive comments about Mountain Rides from the 73 people who participated in the survey in June and July in Ketchum and Hailey. "I think it's integral to a town dependent on tourism," stated one survey participant. "When I tell people about this place, it's one of the assets." "I've never had a driver's license, without it I'd be hitchhiking every day," stated another. "Planning on a job in Sun Valley; would only take it if I could ride the bus in the winter," stated a third. There were a few criticisms of the service in the result summary. "Not enough people using it so it's a wasted resource," stated one critic. "Maybe when gas prices go up it will have more visibility." Other survey participants noted that they would be more inclined to ride a bus if there were more racks for bicycles or if they could take their dogs along. Currently, only service animals or animals in carriers are allowed on Mountain Rides' buses. The survey was conducted by Mountain Rides' consultant Candice Pate, owner of the Anticipate public relations and marketing firm. Pate discussed the survey results with the Mountain Rides board of directors at its monthly meeting on July 18. Pate told the board that the survey "shows that they like us." She also suggested possible changes in service that could bring more riders, including aligning bus service with more special events, adding additional stops in some areas, using the website as more of a marketing tool, increasing the number of racks for holding bicycles and possibly allowing riders to bring their dogs. Mountain Rides Executive Director Jason Miller said the organization is already implementing some of the recommendations, including changes to the website and setting up "more introductory events to get people to try it." He said the board of directors will discuss other possible changes at its next regular meeting in August. Miller said adding more bike racks is a possible change, but that allowing dogs on the buses has been considered before and was not approved, partly because of rider objections and insurance reasons. "I don't know what we'll do on the dog issue," he said. "That's a little more complicated." Mountain Rides provides free bus service in the Ketchum and Sun Valley areas and in Hailey. The organization has paid-fare bus service linking the Ketchum-Sun Valley areas to the Hailey-Bellevue areas. Mountain Rides also provides commuter van service between the Wood River and Magic valleys.